Sydney (Ashley Rae Spillers) turns to her sister Nell for help after her high school crush, Andre Martinez (Delon de Metz), is mixed up in a Russian plot to steal intelligence from the Department of Defense. Also, Special Prosecutor John Rogers (Peter Jacobson) conducts mandatory performance reviews with the team, on NCIS: LOS ANGELES, Sunday, March 24 (9:00-10:00 PM, ET/PT) on the CBS Television Network. 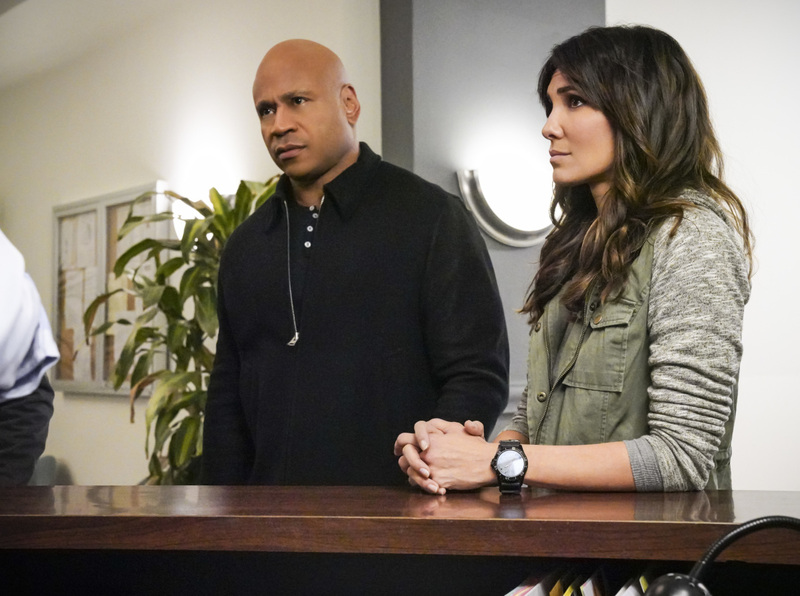 "Born to Run" -- Pictured: LL COOL J (Special Agent Sam Hanna) and Daniela Ruah (Special Agent Kensi Blye). Sydney (Ashley Rae Spillers) turns to her sister Nell for help after her high school crush, Andre Martinez (Delon de Metz), is mixed up in a Russian plot to steal intelligence from the Department of Defense. Also, Special Prosecutor John Rogers (Peter Jacobson) conducts mandatory performance reviews with the team, on NCIS: LOS ANGELES, Sunday, March 24 (9:00-10:00 PM, ET/PT) on the CBS Television Network. Photo: Bill Inoshita/CBS ÃÂ©2019 CBS Broadcasting, Inc. All Rights Reserved. Guest stars in the episode include Peter Jacobson (Special Prosecutor John Rogers), Ashley Rae Spillers (Sydney Jones), Kimiko Gelman (Commodore Cindy Kang), Delon de Metz (Andre Martinez), Carolyn Hennesy (Bunny), Wayne Federman (Eli), Georgia Leva (Hayley), Carlos Ciurlizza (Worker #1), Alastair Bayardo (Worker #2), and Ally Iseman (Horseback Rider).